Recall from the Evaluating Double Integrals over General Domains page that we can evaluate double integrals over general domains by breaking them up into their respective iterated integrals. 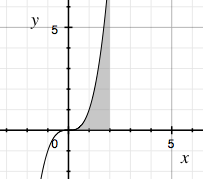 Evaluate the double integral $\iint_D x^2 + y^2 + 1 \: dA$ where $D$ is the region trapped between the lines $x = 2$, $y = 0$, and $y = x^3$. 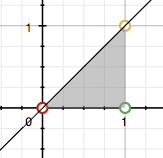 Evaluate the double integral $\iint_D xy \: dA$ where $D$ is the region of points $(x, y)$ contained in the triangle with vertices $(0, 0)$, $(1, 0)$, and $(1, 1)$. 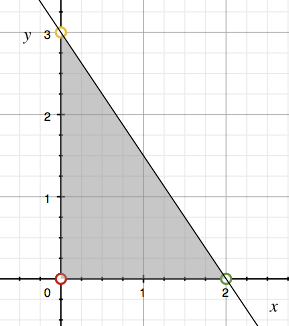 Evaluate the double integral $\iint_D 2x + y \: dA$ where $D$ is the region of points $(x, y)$ contained in the triangle with vertices $(0, 0)$, $(0, 3)$, and $(2,0)$. No matter which way we interpreted $D$ and evaluated the double integral, we obtained the same result.